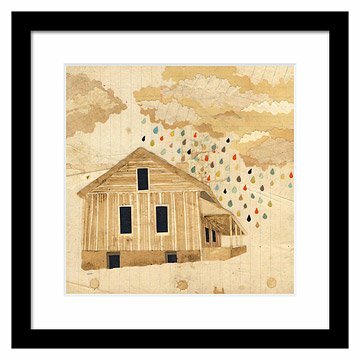 Hollie Chastain's weathered, raindrop collage will shower any space with visual interest. Nature makes us wait for the rain to pass before we enjoy the rainbow, but this intricately layered collage breaks that law. Contrasted against neutral paper, vivid droplets descend upon a desolate home, offering warmth and calm during the storm. The artist, Hollie Chastain, seeks out the most interesting, often imperfect archival paper to use in her work, adding even greater depth to the stories of each piece she creates. Made in Tennessee and printed in Oregon. After leaving a career in graphic design, Hollie Chastain decided to get back in the studio to her analog roots. Collage was a medium she had never given much thought to, so it seemed perfect for a fresh start. She had always been a collector of found and vintage paper, so there was plenty around to experiment with. Hollie found she really connected with the personality and history that reusing these vintage materials added to a work. When it comes her process, Hollie follows her gut and is always amazed by the contrast between weathered, stained paper and bright, colorful bursts. Available framed, ready to hang in a black BonanzaWood® frame and plexi glass or as an unframed print, mounted on white acid free mat. As soon as I saw this piece, I was immediately drawn to it. I hung it right away and so far I've gotten many compliments from- "This reminds me of my grandparent's homestead" to "It makes me want to curl up underneath it with a good book! "- and many inquiries. Every time I glance at it, it just brings me a sense of peace and magic. I love this piece even more after it arrived; it looks perfect on my wall. It is rustic yet the simply framing makes it current. The house reminds me of the farm where I grew up and the background paper straight out of my childhood. The colored raindrops are a great message and bring the entire collage to life. I look at this daily and enjoy it so much.